Subatomic Sound System in Brooklyn Bridge Park on Thursday, August 23! DJ set by Emch kicks of at 6pm. Film at sunset — Clint Eastwood’s roughneck Western: Unforgiven. Details here. Sponsored by Brooklyn Radio, home of Subatomic Sound Radio broadcasts. 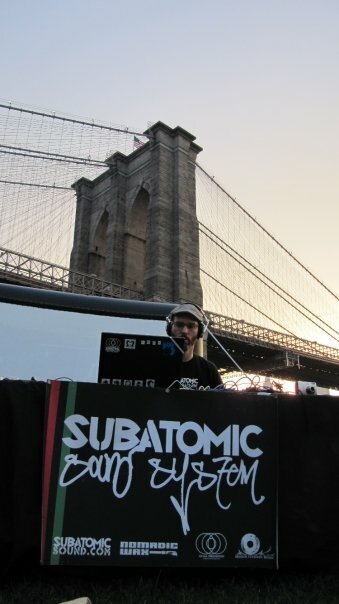 Subatomic Sound System in Brooklyn Bridge Park this Thursday for the Movies With A View series! DJ set by Emch kicks of at 6pm. Film at sunset: Danny Boyle’s Slumdog Millionaire. Details here. Sponsored by Brooklyn Radio, home of Subatomic Sound Radio broadcasts. Emch from Subatomic Sound curates the opening DJs for the film series which runs every Thursday throughout the summer until the first week of Septemeber.